So to accompany my haul I thought I would do a cheeky outfit of the day post to show you my bootsaling attire. I was thinking about this the other day and my blog used to be full of outfit posts but lately it's been more beauty or just silence (sorryyyyyy). So I've decided that I want to pull it back round to plus size fashion which is what I love the most and I think is the most useful for my readers who are predominantly plus size too. So that said let's get on to the CLOTHES! 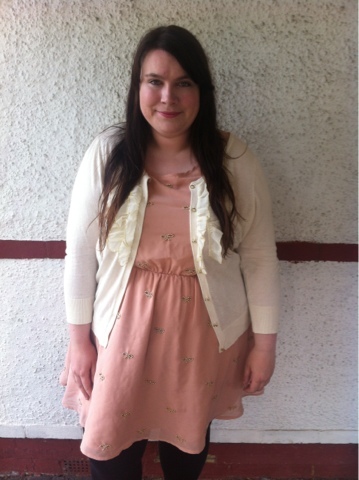 I'm wearing a peachy pink dress from New Look which has an elasticated waist and pretty beaded bow detailing. 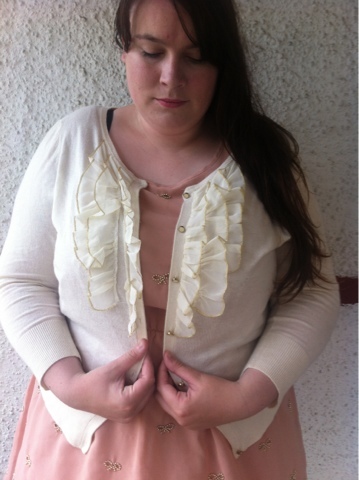 I've paired the dress with a cute ivory cardigan (unbranded market one) which has little ruffles down the front with a golden trim. Half of the way through my bootsale adventure the heavens opened and it was hoods up and fast trot back to the car, my New Look parka coat did me proud. 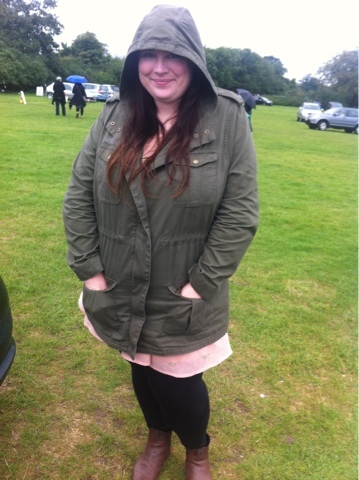 I love this coat as it's lightweight enough for the end of summer/ beginning of autumn, has lot's of pockets and can be drawn in at the waist to add a bit of shape but I like to wear it bigger and grungy. I'm also wearing my favourite chelsea boots which are hands down the best £9 I ever spent! 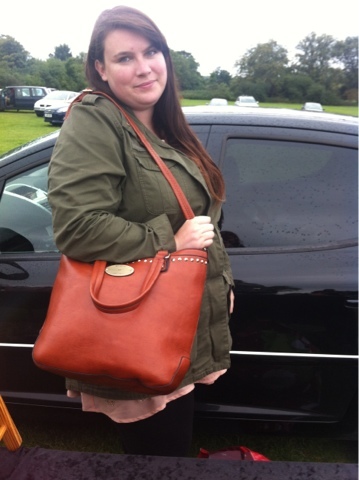 This is me with my sister's fancy new bag which I thought was so nice it deserved a picture mention.